Lock in a great price for Emily's Hotel – rated 8.3 by recent guests! The balcony was excellent with an amazing view of Lake Kinneret. The room was a nice size with a good size bathroom. All the employees were very nice. Plenty of parking. The food was delicious. Thankful for elevators that work. It was perfect. Nice area, beautiful view of sea from balcony, modern looking boutique type hotel. Excellent breakfast with many choices of items! Great value for money!! The staff was OK, friendly, tried to do what they could with an outdated hotel. The breakfast was good. 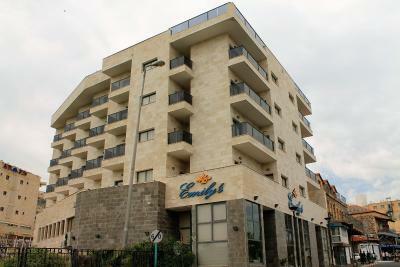 The location was near downtown Tveria (Tiberius), and walking distance from the beach. The included Breakfast was much much more than anticipated! The Dinner Buffet was less expensive than surrounding restaurants. We thought it was worth the price. This was my second stay at this hotel. I returned because I was satisfied last time, and this year was no different. I'd like to give a special positive mention to the excellent service I received by the receptionist. Upon hearing that I will depart too early in the morning to enjoy breakfast, he managed to delay the kitchen staff and allow me to have dinner instead at no extra cost. This kind of special service makes the difference between a good hotel and an excellent one. Well done, Emily's. Looking forward to staying with you next year as well. Location was perfect, wonderful view of the Sea of Galilee from our room, nice breakfast and dinner served in the hotel, free underground parking. Everything! The cleanliness and the food is awesome! 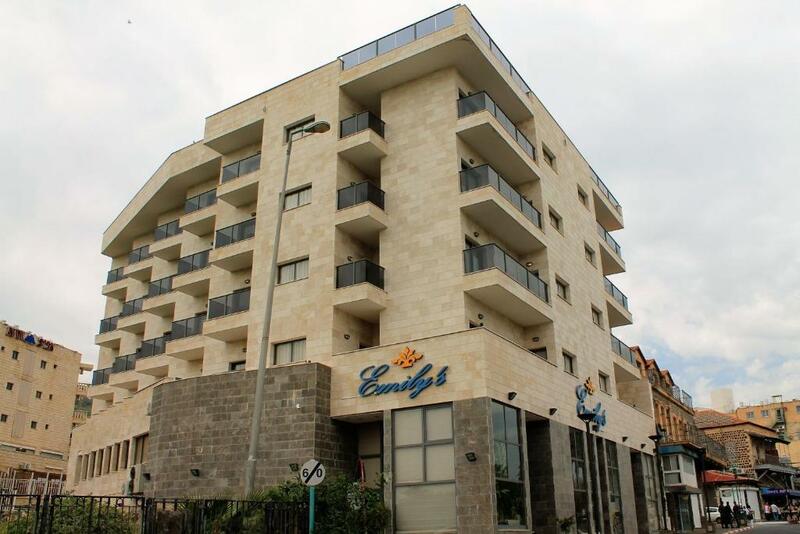 One of our top picks in Tiberias.Emily's Hotel is a design property offering air-conditioned rooms with balcony and free Wi-Fi, and an outdoor swimming pool. 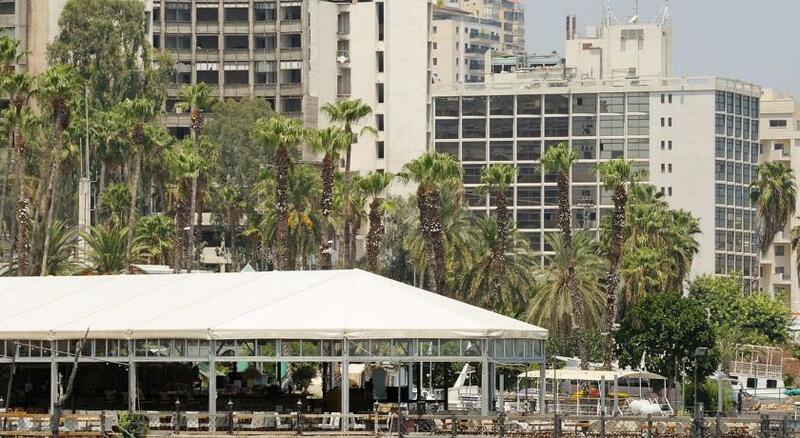 In the center of Tiberias, it is only 150 feet from the Kinneret Lake beach. Parking is free. The rooms feature elegant parquet floors, and come with a tea/coffee maker, a flat-screen TV, and a minibar. The balconies offer views of the lake or the swimming pool. Emily's restaurant serves Mediterranean cuisine for lunch and dinner. Breakfast is an Israeli buffet including eggs, bread, salads, and cheese. When would you like to stay at Emily's Hotel? Room with private bathroom and parquet floors. Offers free Wi-Fi, air conditioning, and a flat-screen TV. The balcony offers views of the pool or the lake. House Rules Emily's Hotel takes special requests – add in the next step! Emily&#39;s Hotel accepts these cards and reserves the right to temporarily hold an amount prior to arrival. Emily's Hotel accepts these cards and reserves the right to temporarily hold an amount prior to arrival. Please note that the pool is open from April until the end of September every day from 11:00 until 18:00. Towels not that great and floors although looked clean because they were wood-type, my socks picked up dirt when walked on floors. The car park with its wet floor. The hotel didn’t have any tourist info in English or if they did, I wasn’t told about it or given anything. The bathroom was really small and the shower could have been cleaner. However the beds were very comfortable. The balcony was pretty and overlooked the Lake The breakfast was superb. Facilities were very dated. lights were burned out, took the staff two days to replace. The pool was closed. The roof was dirty and neglected. The beach was filthy and unusable. Breakfast was good, but had to remind the staff to open the fridge and let us have some yogurt. The bathroom has seen much better day; water leaking out of the shower, the pulley for the shower broken, dirt in the vent. There is a huge crack in the wall, that nobody seems to care about. Lots of dirt behind the beds (had to move the small bed to plug in something, and it was filthy. The front desk staff could have been friendlier. The breakfast was good but not great. We appreciate the free parking. We had to add 17% vat to the price we saw on booking.com - it wasn't clearly mantioned before. The checkout time - at 12:00 pm on Saturday, never saw such a thing in Israeli hotels.. There was a group of bugs in the corner of the room as well as many in the light fixtures (clearly had been there for a long time). The soap dish had new shampoo etc. but had not been cleaned out from the last guests who had stayed there. The underground garage had tons of birds there in the evening with bird poo all over. I was shocked to see birds sleeping above the cars in all sorts of positions and it was freaky as well as unclean. Some birds woke up and flew next to our heads. The food was excellent and the kitchen staff very friendly and helpful. Loved everything apart from no shabbos lift. They had 2 lifts so feel one could have been a shabbos lift.